Two summers ago, I discovered (by going to the podiatrist) I had been walking on a broken foot for a few years. 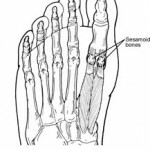 I had a broken sesamoid, which helps your big toe move like a big toe should when pushing off of the ground during walking, running or jumping. 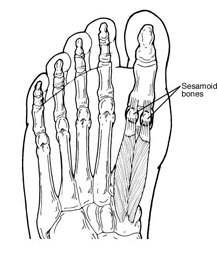 During the years I wasn’t aware my bone was broken, my big toe would feel like it was falling off for a few days at a time and then it would recover. I was forced to go to the podiatrist, though, when the pain lasted for months and my knee and hip started to hurt. Curse the interconnected web of our bodies! 1. The first treatment prescribed was shoe inserts that were intended to take the pressure off my sesamoid during activity. I still walked and went to work with pain; the inserts didn’t help. 2. Then, my doctor prescribed an Aircast boot. This took all the pressure off of the front of my foot and sesamoid area, but also made my hips misaligned. 3. Finally, my doctor prescribed bed rest. My wonderful supervisor had me borrow a laptop from our IT staff group and I worked from home for 5 weeks. Every day, I woke up, showered, got back into bed, powered up my laptop, and didn’t walk for the rest of the day. Good for my foot — potentially terrible for my brain. What to do when movement is very restricted and your scenery is as well? I had a laptop, internet connection and youtube.com, so daily (and sometimes twice daily) guided meditation became my escape. QuietMindCafe has a series of, what I think are, really good guided meditation videos. Since it definitely wasn’t possible for me to do more than simple stretches during my weeks of bed rest, I knew I had to do something else to feel active. Meditation was my solution. I was able to find meditations online for broken bones and pain. I sent a LOT of healing white light to my sesamoid and when I returned to work, I went with a sharp mind and without too much pain. Since this time, I haven’t watched as many guided meditations as I have listened to them on my .mp3 player. I absolutely adore “Meditating with Music”, part of the Meditation Peace podcast series by the Meditation Society of Australia. They also have a fantastic “Train Meditation”, which I listen to sometimes when I’m on public transportation and want to experience more compassion for my fellow train riders. I was glad when my 5 weeks of bed rest were over when I returned to work. I was able to move around — and, years later, I still feel thankful almost daily that I can walk. I’m certain that meditating made my time more peaceful and more bearable. Do you have any favorite meditation websites or mantras? Have you ever had to restrict your movements for extended periods? Did you develop any good strategies?